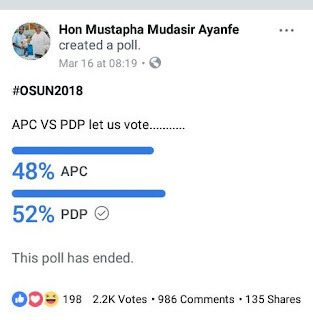 The Opposition Party in the State of Osun (PDP) has defeat the ruling All Progressive Congress in an online poll organized by a member of All Progressive Congress (APC) Mudashir Ayanfe, the coordinator of APC online influencers known as E-progressives . In a 24hours online poll to test the acceptability of the political parties in the State among the populace ahead of the September, 22nd, 2018 gubernatorial election in the State. The ruling party APC polled 1,023votes while the opposition party (PDP) polled 1,187votes which results to 48% to 52% respectively. 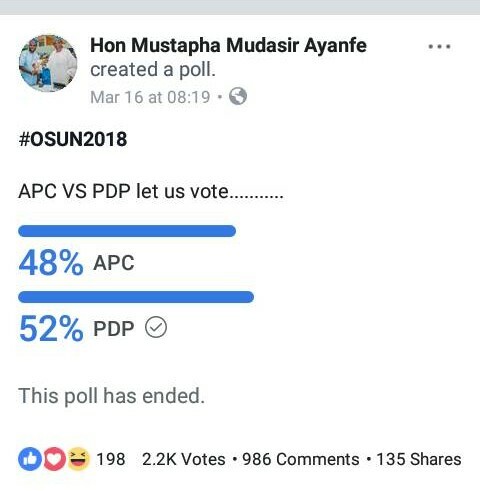 The ruling APC started her severe defeats in the State in 2015 during the election to the National Assembly in Oriade/Obokun Federal Constituency, followed by April 9, 2016 Ife Central State Constituency Bye-Election where APC came 3rd behind PDP and Accord Party, then the July 8th 2017 Bye Election in Osun West Senatorial District that produced Senator Nurudeen Ademola Adeleke. Aregbesola has shown us that the he has no stake in this state by his attitude that he has no interest in our welfare. Unlike other APC governors in the South West who rule their people with love, Arwgbesola is callous and heartless. We can see how governor Abiola Ajimobi is developing Oyo state. He has bastardize that party in osun state.